Make a batch on the weekend so you have handy nutritious snack to pop in the kid’s (or adult’s) lunch box throughout your busy week. Preheat oven to 180°C or 160°C fan forced. Line a large slice tray with baking paper. Set tray aside. Combine coconut oil, nut butter, 1/2 cup honey, salt and vanilla in a saucepan over medium heat. Once melted and combined, remove the saucepan from the heat. Add to the melted mixture the quinoa flakes, coconut, protein powder, nuts, sesame seeds, chia seeds and three quarters of the sunflower and pumpkin seeds. Mix well. Spread mixture into slice tray and press down firmly. 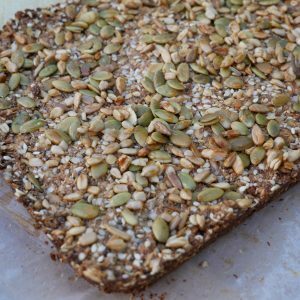 Sprinkle remaining seeds over the top and drizzle with 1 tbsp raw honey. Bake for 25 to 30 minutes until lightly browned. Remove from oven and allow to cool in the tray. Once cooled, remove from tray and cut into bars. Can be stored in the fridge for up to 1 week. I use activated nuts and seeds because they are easier to digest. However, you can use roasted or raw nuts and seeds instead. Any protein powder will work, as long it is a flavour you like. 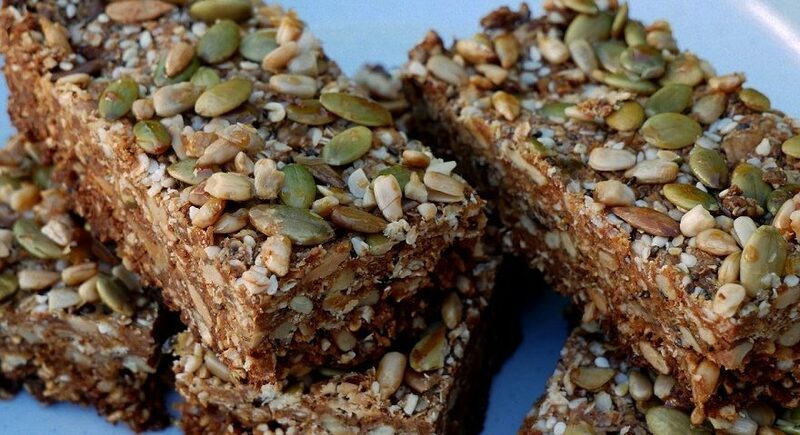 You can add a mix of different nuts and seeds including hemp seeds, flaxseeds, macadamia nut and almonds. If vegan, use maple syrup or rice malt syrup in place of raw honey.